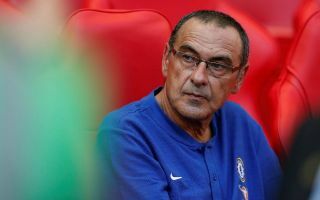 Chelsea manager Maurizio Sarri revealed when misfit Kepa Arrizabalaga is likely to play for the Blues again in his press conference after tonight’s 2-0 win against Tottenham. 24-year-old Kepa made the headlines for all the wrong reasons on Sunday evening after he refused to be brought off before Chelsea’s penalty shootout against Manchester City in the League Cup final. Today a statement had to be made by Sarri and the Chelsea hierarchy to show to the entire dressing room that the manager’s word is final and that it should never be shunned in the disrespectful manner that Kepa showed on Sunday. Fortunately for the Blues they were fine without Kepa between the sticks as Willy Caballero provided safe hands en route tonight’s victory. Tonight’s win was much-needed and this could get Chelsea’s season back on track. In an ideal world for Chelsea fans, the Blues will finish in the top four of the Premier League this season and they won’t have to put all their eggs in one basket by relying on winning the Europa League final to secure Champions League football next season.
? "It was the right decision, Kepa made a big mistake" ? @ChelseaFC manager Maurizio Sarri has reiterated he was right to drop goalkeeper Kepa for the victory over @SpursOfficial!